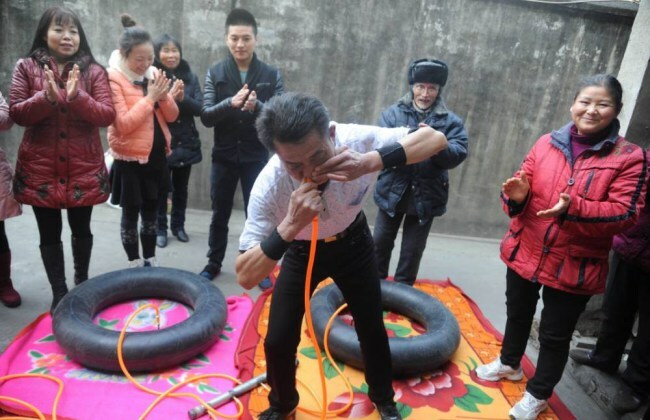 A Chinese man who cured his boils by blowing up tyres has now turned his weird cure into a bizarre performance. Nie Yongbing, from China’s south-west Sichuan province, used to suffer from what he says were ‘really horrible red boils’ on his body. When he visited a doctor, the physician told him that the boils were caused by blockages in his body’s pathways / meridians. The doctor then suggested he clear the blockages by blowing up balloons. Incredibly the bizarre cure worked. But Nie was soon addicted to inflating things and was soon moving on to blowing up tyres and mattresses – with his nose! The 61 year old baker now performs his strange inflating skills to advertise his bakery. “I’ve been doing this for eight years and never had a problem with boils since I started the treatment.It takes me about 20 minutes to pump up a tube with people standing on it.Doctors have told me I have an incredibly healthy lung with an enormous capacity which is great.” says Nie.